Depending on where you are in the world, you may know golden berries by various names, including Cape Gooseberry, Aztec berry, poha, harankash, or Physalis, among a dozen or more other common names. 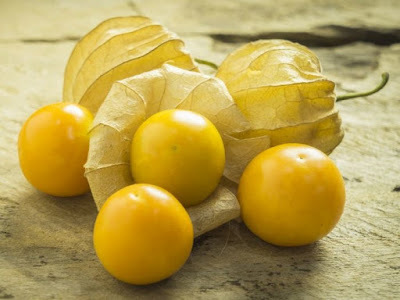 Scientifically, however, golden berries are known as Physalis peruviana, and are widely considered to be a superfood that is loaded with nutrients and antioxidants that can significantly improve your overall health. Although this small yellowish berry is native to South America, it has spread to other parts of the world, including South Africa and Europe, and is exported extensively, hence its many names. Oddly enough, golden berries are more closely related to tomatoes and eggplants than other berries, and are approximately the size of a marble. The berry is sweet and tart, which makes it a popular ingredient in various cakes, sweets, and baked goods, as well as salads and fruit salads. The berries can also be eaten by themselves as a healthy snack. These super berries contain low levels of calories and moderate levels of most vitamins and minerals; however, the real value of this fruit is the antioxidant concentration. Polyphenols and carotenoids are powerful elements of human health, and golden berries contain significant amounts. When combined with the other nutrients, these antioxidants make this fruit so desirable, which would explain its widespread use and demand across the world. Now, let’s take a closer look at some of the health benefits of golden berries. Antioxidant Content: The most important benefits of golden berries are derived from their high antioxidant content, which makes them an ideal nutritional supplement for preventing certain chronic diseases, including certain types of cancers. Antioxidants, like the carotenoids and polyphenolic compounds found in golden berries, can neutralize free radicals, the damaging byproducts of cellular metabolism that can cause healthy cells to mutate into cancerous ones. This is the quality that makes golden berries a “superfood”. Research has shown that polyphenols can stop the spread of various types of cancer, making it a very important food source in many parts of the world. Anti-Inflammatory Activity: One of the other effects of antioxidants is a reduction in inflammation. If you suffer from arthritis, gout, muscle aches, chronic pain, or even hemorrhoids, anti-inflammatory compounds can soothe these conditions and increase your quality of life. Inflammation of the arteries and blood vessels is also very dangerous for the cardiovascular system, so golden berries are also able to improve heart health by reducing the strain on that system and preventing the development of atherosclerosis and coronary heart disease. It effectively lowers blood pressure as well, which further decreases the symptoms of hypertension and gives relief to your heart. Weight Loss: As a low-calorie food (only 53 calories per 100 grams), golden berries present an interesting option for people trying to lose weight. These tiny fruits deliver a large percentage of your daily nutrients, yet don’t contribute negative fats or calories to your overall intake, helping to keep weight loss goals on track! Fatty Acids: Although many people think of fats as bad things to put into our body, we actually need a wide variety of essential fatty acids for many of the natural processes in our body. For example, the oleic and linoleic acid in golden berries actually lower the amount of “bad” cholesterol in our bodies and re-establishes the cholesterol balance to ensure heart health in a different way. Withanolide Content: You don’t often hear about withanolides in health food discussions, as they are quite rare, but they are found in golden berries. These unique organic compounds, similar to those found in ginseng, are powerful antioxidant and anti-inflammatory agents that can prevent apoptosis, or automatic cell death, and can slow or even reverse the spread of cancerous cells throughout the body. Diabetes Management: Some of the compounds found within golden berries can slow the breakdown and intake of simple sugars from carbohydrates. This means that the body and bloodstream is not flooded with sugar, and insulin receptors are properly regulated. Drastic blood sugar fluctuations are the main cause of diabetes, and can be very dangerous for people suffering from that condition, meaning that golden berries are an effective preventative method and treatment for Type II diabetes. Liver and Kidney Health: Although the exact pathway for this benefit isn’t completely understood, one of the withanolides contained in golden berries has been associated with a reduction in liver scarring and a reversal of liver degradation. Furthermore, golden berries are linked to optimal kidney health, helping to eliminate toxins by stimulating urination and flushing out excess fats, salts, and toxins from the lymphatic system. Vision Health: Due to the high carotenoid content found in golden berries, they are often suggested for boosting the health of your eyes. Carotenoids specifically eliminate oxidative stress on the ocular system, preventing the development of cataracts and slowing the onset of macular degenerations, keeping your vision in top working order as you age. Immune System Benefits: The significant level of vitamin C (almost 15% of the daily recommended intake) in a single serving of golden berries makes this a very important fruit for the immune system. Vitamin C (ascorbic acid) stimulates the production of white blood cells and also has certain antioxidant properties itself. Furthermore, vitamin C is a key component in the production of collagen, which is what the body needs to repair and produce cells, tissues, organs, and blood vessels. A Final Word of Warning: Eating unripe golden berries can be poisonous, so picking them from the wild is usually not recommended. Also, if you suffer from an allergy to other berries, be sure to speak with your doctor. Although golden berries are more closely related to nightshade plants than cherries or other berries, the allergenic potential is much the same.